A beautiful morning. 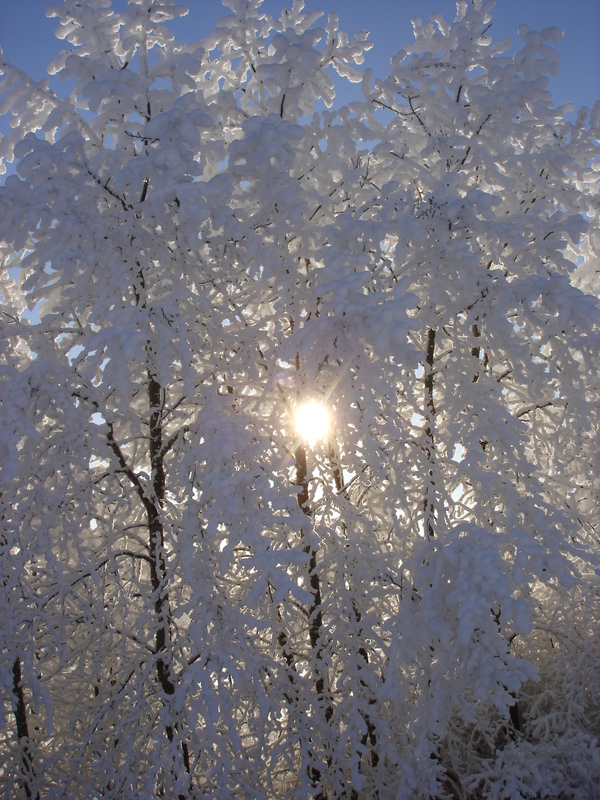 Trees heavy with frost, glimmering in the early morning sunshine. Made me smile. Believe. Spring it’s just around the corner. Morning has broken in Bon Accord. And at least this morning it wasn’t freezing. 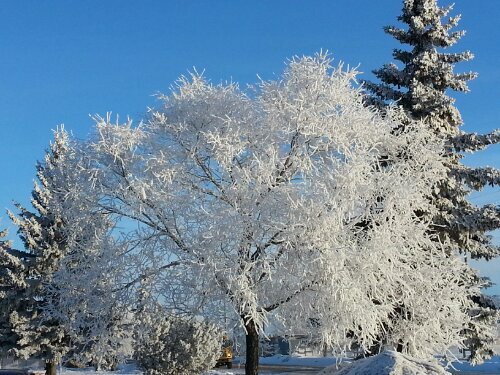 We had a fairly heavy frost the night before last, but last night I think we were frost-free. Still, I am wearing gloves in the morning on my walk. I love Fall, but I hate the impending cold. I wish it could be about 10 degrees in the mornings and then warm up to about 25 throughout the day, slowly lowering to a manageable 14 or so throughout the night. That would be perfect. It’s the colours of Fall that are so enchanting, I can’t wait to see all the trees turn shades of red and gold. And then there are the smells: that spicy, almost musky smell of leaves as they fall and collect on the ground; the deep, rich smell of earth as gardens and fields are cleaned up of the decay from another growing season. It’s an intoxicating mix. I took my first camera class on Tuesday. It was a little basic, but I did learn a couple of things about my camera that surprised me. I’m looking forward to next week, and will be definitely signing up for future classes. I am hoping to discover the secrets that make some of my fluky photos so good, while others are just abysmally bad. Not that I ever expect to be a pro, but I would like to have some consistency about the pictures I take, and a better understanding of this lovely camera and how to make it do what I want it to do. Work is a bit of a trial this year. New schedules, plenty of changes. It’s been a stressful couple of weeks. I think, though, I’m finally settling into the changes. Me and change — never a good mix. It’s grandson #2’s birthday this weekend. He will be 2 years old. My goodness they are growing up so fast. Beginning to think I’m an old granny! LOL. My son came over last night and helped his father draw up a plan for our deck. Hopefully, before too much longer we’ll start the building process. As with all things we do, this one is not as simple as we had hoped. But with Landon’s help I think we’ll finally get things underway. I am so thankful, Bud. Well, I guess that’s about all the time I have for an update. A busy day, evening and weekend ahead. Hope I get back here before the weekend is out. Thursday morning, a little frosty. . . It's not this bad -- yet. We have had a couple of very cool days this week and today is going to be no exception — a forecasted high of 17 degrees. Then cool and rainy tomorrow. (I think my husband’s motorcycle trip may have to be postponed until next year.) But, the weekend is supposed to perk up. Hope so, for all the long-weekend campers. My husband will be helping my son build a deck. Not mine. His. I think the deal is if they get Landon’s done, then mine will be next. Fingers crossed! My daily schedule of house-cleaning has, so far, been a success. I have a clean and tidy home, I’ve had a little bit of free time in the evenings and I’m getting to bed on time. So, I’m feeling pretty darn special right now. Like, wow, look at how organized and efficient I’ve become! Of course, I haven’t gotten any writing done — I did look up a couple of contests and got caught up on a couple of e-newsletters I subscribe to — so I’m counting that as productive, creative output. There’s always next week. I have to figure out a way to squeeze in some extra exercise time. I need to be doing some weight-bearing exercise — in order to head off osteoporosis, you know. I walk every day so I’m on top of the threat of Alzheimer’s. I have all but eliminated most processed foods from our diet (there are a few things left over from previous shopping trips — I won’t throw out food, but we’re almost there) so we’re eating more healthy and feeling much better. All in all, I’m being about as positive as one person can be without coming off as crazy. Here’s to new starts, and positive thinking.